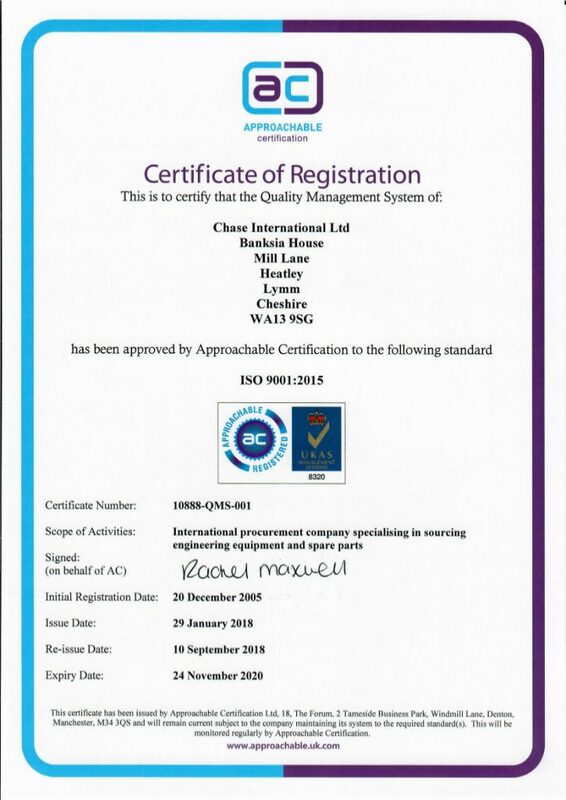 CHASE International was founded in 1982 and is based close to the main Industrial areas in the UK and a short distance away from Manchester International Airport. We respond to demands from customers throughout the world and provide a cost effective solution to sourcing engineering equipment and spare parts that are manufactured in the U.K. and Europe. Through experience we have an understanding of the difficulties which can be encountered in obtaining supplies of goods at a realistic price level with delivery when required. In addition, our consolidation of purchases in many cases enables us to negotiate additional discounts. Our customers have found this extremely beneficial. CHASE has a proven expertise in managing the sourcing requirements for major projects, especially when equipment needs to be obtained from multiple suppliers across Europe. This speciality has proven to be exceptionally invaluable by several of our customers who exclusively retain CHASE to handle all their European purchasing. Communication is key and our team will keep you regularly informed on the progress of your orders as we liaise with suppliers to meet your deadlines.